Today’s AM fix was USD 1,349.50, EUR 980.81 and GBP 840.23per ounce. Yesterday’s AM fix was USD 1,346.75, EUR 978.81 and GBP 837.06 per ounce. Gold dropped $8.40 or 0.62% yesterday, closing at $1,344.60/oz. Silver rose $0.01 or 0.04% closing at $22.48. Platinum fell $15.50 or 1.1% to $ 1,454.50/oz, while palladium slipped $0.78 or 0.1% to $742.72/oz. Gold was treading water below five week highs today, as investors weighed the decline in Chinese demand from record levels with still very robust demand in India. Silver is up 1% as robust industrial and store of wealth demand supports silver. Gold prices in China closed lower than global prices yesterday for the first time this year. This may be due to a slight decrease in demand in recent days. There was also speculation that this was due to fears of a credit tightening and the possibility of a credit crisis in China. Indian premiums stayed near record highs at $130 per ounce due to a supply crunch and supply shortages. Hedge funds and money managers raised bullish bets in futures and options of U.S. gold and silver markets for the week ended October 8, the latest report by the Commodity Futures Trading Commission (CFTC) showed. More savvy trend following speculators are getting long gold again in anticipation of higher prices. The Fed will make a statement later on Wednesday at the end of its two-day policy meeting. The bank is widely expected to say it will stay on course with its ultra loose monetary policies and will not reduce its money printing, debt monetisation programme. U.S. stocks closed at historic highs on hopes that the Fed will continue supporting and indeed creating another liquidity driven bubble. 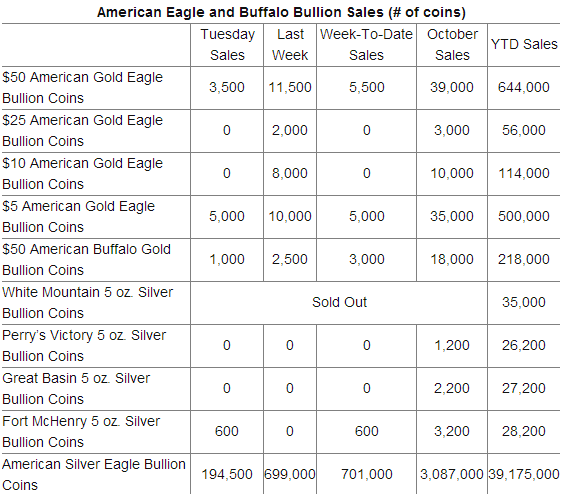 U.S. Mint sales advanced across all bullion products in October. In total ounces, U.S. Mint distributors bought 5,000 ounces of gold coins and 197,500 ounces of silver coins. Silver Eagle bullion coins advanced 194,500 for a year-to-date total of 39,175,000. This means they are on track for a new annual record - surpassing the record seen in 2011. When the annual record for the Silver Eagles happened in 2011 at 39,868,500, it took until December 13, for sales to reach the levels reached this year. The U.S. Mint’s sales of American Eagle silver coins have reached 3.087 million troy ounces so far this October and have surpassed the September sales figure, according to figures from the U.S. Mint’s website. Sales increased to 3.087 million troy ounces in October from 3.013 million troy ounces in September. The figures are as of yesterday and at that pace, total sales for the month would be 3,381,000 ounces, up 7.2% from a year earlier. The chart above clearly shows the long term trend towards higher silver eagle demand in recent years as store of value buyers accumulate silver eagles to protect against currency devaluation and wealth confiscation. 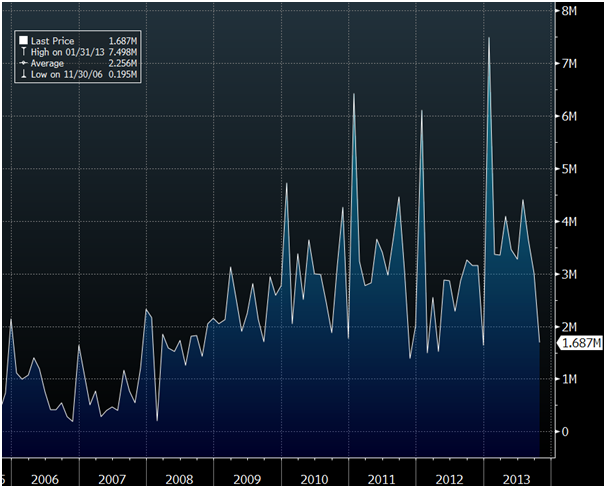 Some of those who bought silver in 2011 as an investment may be reluctant to buy more silver due to recent volatility. We have long pointed out that silver is not an ‘investment’ per se rather it is a store of value and a form of financial insurance. Silver is to be bought for the long term - until it has to be sold due to a need to raise cash – indeed a permanent holding. Realising this helps people stomach the short term price swings that are typical in the silver market. This is important as silver will protect them from currency devaluations and the coming bail-in regime. It is worth pointing out that all markets are volatile today and silver’s volatility is often exaggerated. Silver remains undervalued from a long term, historical, inflation adjusted perspective. Our long held belief that silver could reach the record 1980 high in real terms, inflation adjusted, if $140/oz remains. Immediate support is at the $18/oz to $20/oz level (see charts) and store of value buyers should continue to accumulate on this dip.